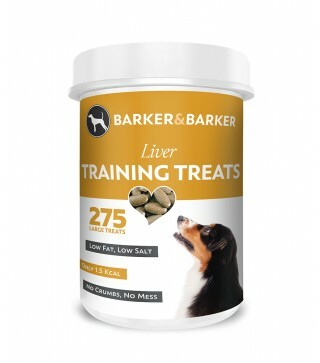 Our Large Liver Treats have been created especially for medium and large breeds for training or as a simple reward. They provide a very tasty, low fat and naturally healthy treat that your dog will love. These treats are easy to break should you wish to share them with smaller dogs. They are still exacty the same tasty mix that we use in all of our Liver Treats, just a larger size. These treats weigh in at 1000mg each for a meatier treat! Not recommended to feed whole to toy and small breeds. If you want to share with smaller breeds that fine, just make sure you break them up first. 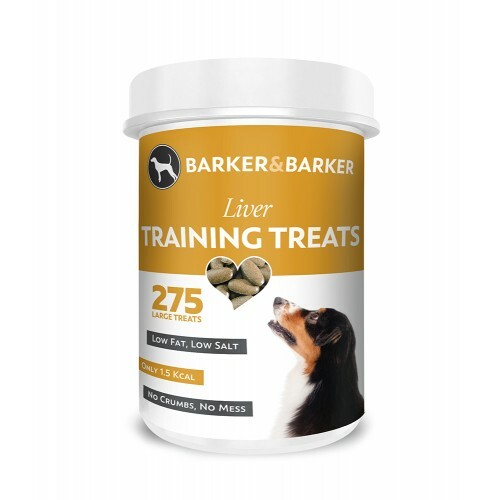 As with all Barker & Barker liver treat varieties, these large treats will not break up in your bag or pocket and won't leave a nasty smell. Just warm a treat in your hand to release the characteristic aroma of liver, break one over your dog’s nose and enjoy their undivided attention. NOTE: Remember to take any treating into account with your dogs daily food intake allowance. As with all treats and food, make sure your dog has fresh water available should they want it.